The graveyard of radio history is scattered with attempts to create America’s fifth nationwide network. The Progressive Broadcasting System was one of the shortest of those efforts - 67 days from November 26, 1950 until January 31, 1951. It was also one of the strangest. Progressive was headed by 37 year old Larry Finley, a Los Angeles entrepreneur and transcribed program producer. 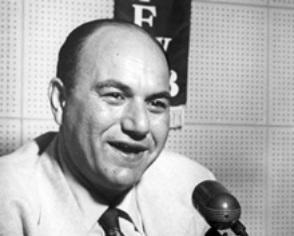 His objective was, “Initial service to 250 affiliates and expansion to 400 stations by February, 1951”, for his network’s programs which - not surprisingly - he would produce and transcribe in Los Angeles. The enterprising Finley also claimed to have, “Over a million dollars,” in funding available from partners who included a wealthy supplier of linens to Las Vegas hotels and a Nebraska liquor distributor. He began immediately to spend his bankroll. Traveling extensively and establishing network offices in New York, Chicago, Los Angeles and Dallas, Finley surrounded himself with former network executives for his venture, headed by Miller McClintock, past president of Mutual from 1942 to 1944. But unlike the four major networks which basically provided sponsored programming to their affiliates and paid the stations for their time, Finley planned to provide programming for local sale to his affiliates and charge them for the shows that they accepted for broadcast. Progressive’s networking concept was inspired by the many syndication firms profiting at the time by distributing transcribed programs of every kind to stations in large and small markets alike around the country. Syndicators were making a fortune with recorded fare that ranged from dramatic series starring famous Hollywood names, (Bold Venture with Humphrey Bogart and Lauren Bacall and Ronald Colman‘s Favorite Story, for example), to adventure series, (among which The Cisco Kid and Boston Blackie were highly popular), to music shows of every genre from the biggest of the big name bands to small country groups. (See Fred Ziv - King of Syndication on this site. Independent stations, in particular, bought syndicated programs to compete with the variety and big name talent offered by network affiliates. And the leased transcriptions provided subscribing stations with relatively high quality programming to offer to local advertisers. Finley had experience in the field, his biggest success in the late 1940's was the revival of the serial Myrt & Marge, which he had sold to over 80 stations by 1948. Finley wanted to eliminate syndication’s biggest costs: 1/ The production and distribution of durable, broadcast quality transcription discs would be replaced by AT&T line transmission; 2/ An expensive sales force calling on individual stations wouldn’t be needed because PBS affiliates would become hundreds of built-in customers paying program fees of at least $580 per month plus four to 40 dollars per program per month in talent charges. Progressive’s programs, mostly 15 minutes in length and designed to appeal to housewives, were planned for delivery to affiliates for broadcast between the hours of 7:00 AM and 7:00 PM, local time. To save line charges over great distances, Progressive planned to ship its recorded programs to three anchor stations - WNJR/Newark, WCFL/Chicago and KGFJ/Los Angeles - which would then feed the shows via AT&T lines to affiliates in their respective time zones. No anchor station in the Mountain Time Zone was found for the network. Finley lined-up talent and began producing his PBS programs in October. Actor Guy Madison was signed to host the weekday strip, All American Quiz, actress Ellen Drew was contracted for People Are Wonderful, Barbara Britton took the lead of a weekday soap opera, Hollywood announcer Maurice Hart was assigned a daily interview show, From The Hart of Hollywood, and veteran movie comedian Hugh Herbert was designated for a weekly sitcom. Progressive’s three-hour November 26, 1950, premiere broadcast, Salute To Progress, went off without a hitch. It was an ambitious project, co-hosted by Finley and Harry Von Zell featuring the likes of Bob Hope, Peggy Lee, Mel Torme, Stan Kenton, Spike Jones, Eddy Arnold and Rex Allen, many of whom appeared by transcription. “With PBS we are carrying radio’s greatest programs!” - KAPF, Petaluma, CA. “Progressive’s tops! Looking forward to all PBS shows.” - WKAI, McComb, IL. “We are off to a glorious future!” - KVAN, Vancouver, WA. “There’s no doubt in our minds regarding the success of PBS.” - WDOV, Dover, DE. “All PBS stations are due for a very great success story.” - KVSM, San Mateo, CA. “Thank God and congratulations to PBS.” - WCYB, Bristol, VA. The Almighty obviously didn’t have anything to do with Progressive. The next words about the network appeared in trade publications dated February 5, 1951: PBS Closes - Fifth Network Suspends Operations. Larry Finley’s dream of 250 affiliates at his network’s start turned out to be only 60, mostly located in small markets, His projection of 400 stations by the end of January was only 90. He threw in the towel on January 31st after losing $100,000 of his own money and another $400,000 of his investors' funds. It was explained that expenses were grossly underestimated and that the first year's operating budget was blown in the first two months. Progressive owed AT&T $30,000 a month in transmission charges and accumulated a talent bill of $29,390 owed to AFRA performers. Variety reported that Progressive closed its books $382,000 in the red, (3.47 Mil in 2015 money). When next heard from, Finley was attempting to sell installments of three PBS serials that had already been produced - Cindy with Jeanne Cagney, Hope Emerson's Betty Carr, Private Eye and the Barbara Britton soap opera - to other networks or syndicators. Meanwhile, 30 of Progressive’s former affiliates signed on with Gordon McLendon’s sports oriented Liberty Broadcasting System. But always the optimistic entrepreneur, Finley bounced back as a Los Angeles radio and television personality and founded the International Tape Association which did much to standardize audio and video tape formats. His death in 2000 at the age of 87 resulted in a lengthy Los Angles Times obituary saluting his achievements. But there was no mention of The Progressive Broadcasting System.